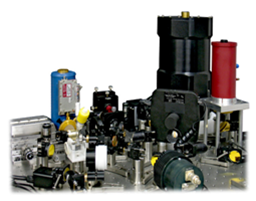 The Laser Heterodyne Radiometer (LHR) is a passive instrument developed by the STFC Rutherford Appleton Laboratory which combines high spectral resolution (for vertical resolution), high spatial resolution (to see between clouds), high sensitivity and compact size (c.f. FTIR), attributes which make it especially suitable for monitoring tropospheric trace gases of relevance to air quality (e.g. O3, CO, HNO3, NO or NO2) or composition-climate interactions (e.g. H2O, O3, CH4 or CO2) from high-altitude platforms (HAPs) or satellite (polar orbiting or geo-stationary). For trace gases measured in combination with UV/VIS/SWIR, the different height sensitivity of nadir-IR measurements by LHR also offers potential to resolve near-surface (i.e. boundary layer) concentrations. The technique is sensitive to polarization and so could potentially be used also for characterization of cloud scattering properties. A CEOI Case Study on the LHR can be downloaded for further information. The LHR is based on the relatively new technology of quantum cascade lasers (QCLs). These are semiconductor devices with a physical size of a couple of millimetres, operating in the mid-infrared (and extending to the far infrared and the terahertz) part of the spectrum and providing milliwatts of output power. QCLs are robust devices with lifetimes in excess of five years. Their compact size and their high output power allow the efficient implementation of several detection channels and potential for array detector illumination. The LHR mixes incoming radiation (from the atmosphere, the Sun, a star, a planet, or any source of infrared radiation) with that from a QCL local oscillator on a high-speed photodiode. The resulting signal is in the radio-frequency domain. The signal recorded is a function of the intensity of incoming radiation at the emission wavelength of the QCL. By tuning the wavelength of the QCL the emission spectrum of the incoming radiation may be recorded. The spectral resolution is determined by an RF filter. The field of view of the LHR is related to the wavelength of radiation, as is the sensitivity which increases towards longer wavelengths. A prototype LHR has been constructed by STFC. This is a ground-based instrument based on a less than metre square bread board. The instrument has been successfully demonstrated through solar occultation measurements and laboratory measurements of emission from room-temperature gases contained in sample cells. This work has identified a number of areas where further development is necessary in order for the prototype to realise its full potential in terms of sensitivity and stability of operation. In addition to implementing these improvements investigations are necessary to fully characterize each of the modifications in terms of impact on the overall instrument performance. The common theme in each of the developments is the reduction of instrument noise, with the ultimate objective of producing a shot-noise limited instrument. Besides the technical development, studies are required to determine; how the improved instrument would perform if deployed on an aircraft or satellite platform, what are issues surrounding space qualification and identification of mission opportunities. This work is being carried out by STFC (instrument development, performance simulations) in partnership with Astrium Ltd (roadmapping and mission opportunities, etc) as part of the CEOI. Further development to miniaturise the instrument using optical hollow waveguides, another CEOI-funded technology under development, has been carried out with QinetiQ Ltd.